At thirteen, Jeff was kidnapped at knifepoint by a man he knows only as Ray, who holds him prisoner and sexually and emotionally abuses him for two and a half years before returning him to his family. Now Jeff is left to pick up the pieces of his life, all the while questioning how his friends and family view him and trying to figure out how he should view himself. He has to learn how to trust again, not just others, but himself. As my eyes adjusted to the dark, I froze, horrified, as I thought I saw the silhouette of a man standing against the far corner of the house. I squinted, hoping the outline would reveal itself as something else: a hedge, some gardening equipment, the shadow of a tree…but the image only became more defined. Finally, I broke contact, looking down, not wanting to believe my eyes. 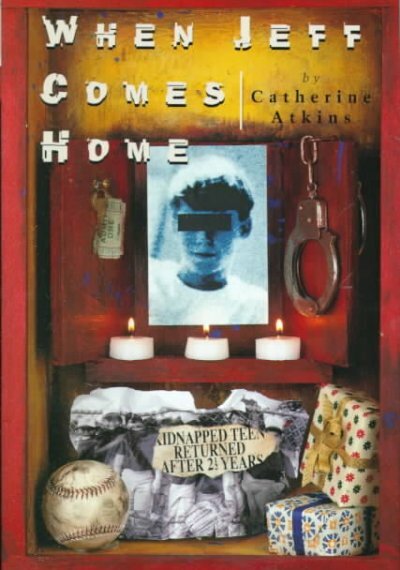 Many of the reviews I’ve read of this book, especially the enthusiastic ones (such as this one and these on Amazon), note the gritty realism of Atkins’ writing, and I agree, to a point. She doesn’t provide prurient details, but you don’t have much doubt as to what Jeff has suffered. A lot of beginnings writers make this mistake: a character does something and then does something else, often undoing the first thing. It doesn’t really take the reader anywhere, actually; it just fills up space on the page and in the reader’s mind. It doesn’t tell us much about who these characters are, other than their predilection for tightening their fingers around steering wheels and then relaxing them. Most troubling, however, was the assumption made by Jeff’s friends and classmates that since he was sexually abused, he must have been a willing participant in the abuse, and is probably even gay. Perhaps our society has moved on in the dozen years since this novel has been published, but I found this aspect of the book highly unlikely, especially given some recent high-profile cases which almost mirrored this book. Given that the main thrust of the book is not just Jeff’s physical escape from Ray, but also his mental and emotional escape, this aspect may be overplayed (after all, most people who sexually abuse children are not gay), but I credit Atkins for dealing fairly openly with the topic of kidnapping and abuse. I’m sure that young readers will find this a compelling read. Of course, there are also those readers (who live here and here on Amazon) who focus entirely on the prurient aspects of the book and are put off by it. Such people are apparently unable to see the forest through the trees, and indeed, only see a single tree. Oh well. Their loss.